MENOMONIE, Wis. - Apr. 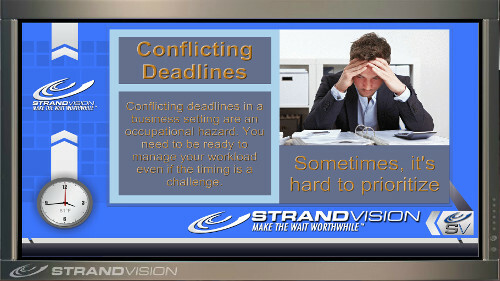 14, 2015 - StrandVision Digital Signage today introduced a library of employee communication electronic signage page templates that addresses Time Management topics. These pre-produced, animated digital signage pages are designed to be interspersed with customers' announcement pages in their employee digital signage networks. The Visitor and Employee Time Management Library includes approximately 50 attractive digital signage templates that are animated to attract additional attention. The new Time Management Communications Library includes a wide range of topics from encouraging strong habits, personal and professional balance and tips to keep schedules on-track. The category addresses the importance of planning realistic schedules, delegation / prioritization, separating work from home, taking vacations and reducing distractions. The Time Management Communications Library combines the 50 specific topics from one of six random animation sequences to provide a mix of eye-catching pages that attract and hold viewers' attention. Each page consists of an attractive graphic and a short, animated text message on the topic. The Communications Library pages are added into the customer's normal digital signage page mix. StrandVision customers and Free Digital Signage Test Drive participants can add the pages with a single click at http://www.svds.co/. ?installimage&e=1&i=LI4FX874K8J5UTBDBT83L352Y295F on the StrandVision Digital Signage Content Management System (CMS). "Even after more than 30 years in business, I was pleased to learn and incorporate several new concepts from these topics into my daily life," said StrandVision founder and CEO Mike Strand. "I am confident that the Time Management animated template set will work equally as well for young and old digital signage viewers to ease stress while improving morale and productivity." The StrandVision Animated Communications Library covers 15 themes from diversity and ethics, to safety and morale, quality and time management, spanning hundreds of specific subjects. Designed for both employee communication and general public audiences, the Communications Campaign Library motivates, educates and informs digital signage viewers while demonstrating the customer organization's commitment to worthwhile personal and corporate initiatives. The total number of communication library pages that can be added to an account varies by subscription level. Time Management Communications Campaign Library template pages are available immediately at no charge to all StrandVision Digital Signage subscribers, as well as StrandVision Free Digital Signage Test Drive participants. See sample templates at: http://www.strandvision.com/corporate_social_responsibility_samples.html or call 715-235-SIGN (7446) or email sales at StrandVision.com.